SoapBoxLA: CityWatchLA - Is LA Developing Tunnel Vision...Again? CityWatchLA - Is LA Developing Tunnel Vision...Again? LA's most recent commitment to connectivity demonstrates a complete disconnect from our history, from the wishes of the community, and from reality. 90 years ago the City of Los Angeles implemented a School Pedestrian Tunnel Program in an effort to address the brutal fact that fully 2/3 of all traffic collision deaths were pedestrians. LA's noble but misguided experiment with segregated underground facilities for pedestrians was limited by the sheer complexity of the initiative and was soon replaced by more effective strategies such as implementation of traffic control devices, crosswalks, all-stop phases, pedestrian right-of-way standards and traffic enforcement. LA's tunnels have theoretically been maintained by the City’s Department of Public Works which relies on a meager "Bridge and Tunnel Maintenance Account" funding that apparently fails to cover any security improvements, let alone even simple maintenance costs. Community concerns over the deteriorating condition of the tunnels date back 40 years when the Los Angeles Board of Education referred to some of the tunnels as "unsafe, filthy places that harbored criminal activity." The LA went so far as to adopt a policy for pedestrian tunnel closure that required the participation of the City Transportation, the LAPD, the Board of Education, and local community members. Over the years community groups have rallied to address the blighted tunnels in their neighborhoods, pointing out the inherent design flaws that create inhospitable environments for vulnerable pedestrians. 25 years ago Atwater Village residents spent a year collecting petitions in an effort to close local tunnels that the LA Times referred to as "smelly, dangerous lairs for gangs, graffiti artists and drunken slumberers." Councilman Wachs, LAPD Capt. Cunningham, and Fletcher Drive Elementary School Principal Christensen called for the closures. Evidence such as trash-littered tunnel entrances, human excrement smeared floors, graffiti marked walls, and empty beer bottles confirmed the wisdom of their actions. More recently, communities such as Woodland Hills and Valley Village have fought to close pedestrian tunnels under their freeways, citing the same concerns of public safety and ineffective connectivity. Two tunnels in Woodland Hills run under the Ventura Freeway and they came under scrutiny when LAPD's Sgt. Kearney was attacked in the Sale Avenue tunnel by two men who hit him over the head with a beer bottle and then charged at him with a long kitchen knife. Two tunnels in Valley Village run under the Hollywood Freeway and they also came under scrutiny when their seclusion resulted in criminal activity and long-term encampments that prevented local residents from enjoying the adjacent parks. Through it all, it's typically local residents who partner with the LAPD and local schools in an effort to make the streets safer for the pedestrians and the neighborhood safer for everybody. Tunnels have been closed all over the city, some filled with cement, some simply barricaded, and others fenced off and locked with a padlock. These tunnels have all been closed ... until now! Current proposals for connectivity include re-opening two tunnels that connect to schools and re-opening two tunnels that connect to parks. In one case, funding requests have been made in an effort to reopen the tunnels and enhance them with better lighting. In the other case, reopening previously closed tunnels has been positioned as an "option" in a City Planning document. Training children to fear the streets instead of supporting them with traffic calming measures is a complete abdication of responsibility. 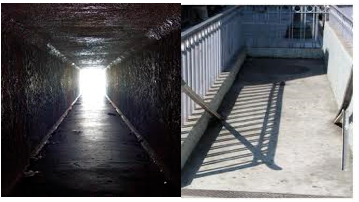 Training children to use underground tunnels contradicts simple crime prevention standards that include awareness of surroundings, staying visible, and keeping an escape route. Simple self-preservation strategies are at odds with "Walk into the tunnel!" Most importantly, the ever present trash and debris is a signal that the area is unsupervised. It's a signal to turn away and seek another route. Current efforts to enhance connectivity are noble, especially because they address the needs of pedestrians and cyclists on their way to school. But it's imperative that Crime Prevention Through Environmental Design Standards (CPTED) serve as a foundation for all proposals and that the safety of people of all modes are supported on the streets of Los Angeles. Most importantly, any efforts to address connectivity must start by connecting the LAPD, Councilmembers, Neighborhood Councils, the local schools, the LADOT, City Planning, Public Works, Caltrans, local residents and anybody else who has a vested interest in mobility and public safety on the streets of Los Angeles. Many times I have thought that it is the cars that should go in tunnels underneath where we walk, live, and play--not the other way around. It's instructive to look through the stories on pedestrian tunnels in the LA Times archive. As you point out they were an instant failure. Parents even organized protest marches against tunnels in the 1950s. It's unbelievable that the city would consider using them again. They might, however, make interesting alternative art/performance spaces. Open them up for events periodically? A little creative reuse? CityWatchLA - Streets are for People!